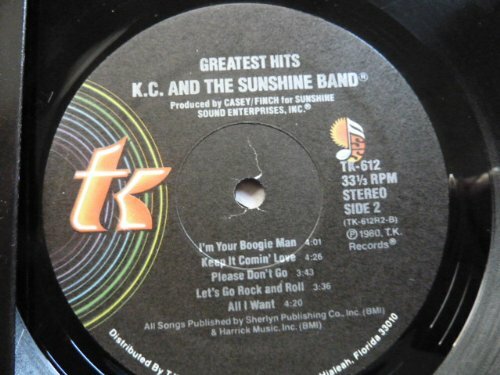 K. C. and the Sunshine Band: "Greatest Hits" long-playing, 33 1/3 rpm., 12", vinyl record. 1980 T. K. label, TK-612, stereo. Side One: SOUND YOUR FUNKY HORN / QUEEN OF CLUBS / GET DOWN TONIGHT / BOOGIE SHOES / THAT'S THE WAY (I LIKE IT) / SHAKE YOUR BOOTY. Side Two: I'M YOUR BOOGIE MAN / KEEP I COMIN' LOVE / PLEASE DON'T GO / LET'S GO ROCK AND ROLL / ALL I WANT. If you have any questions about this product by T.K., contact us by completing and submitting the form below. If you are looking for a specif part number, please include it with your message.